In a recent email, we sent out a survey asking hockey players for training and nutrition questions that they want answered. I picked the top questions and answered them below. 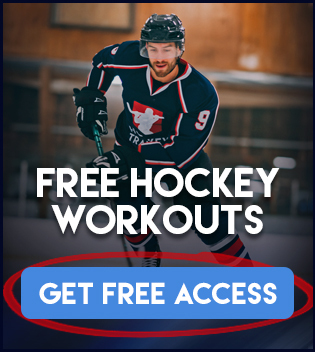 In addition to reading this important question and answer article, I would highly recommend downloading the FREE Explosive Speed Package here where you will get instant access to even more content and hockey workouts to make you a faster skater that is not available here. How Should I Warm Up Before Hockey? I wouldn’t incorporate any static stretching, it’s just simply unnecessary and has mixed research behind it. A standard dynamic warm up (such as the one below) plus whatever your coach wants you to do on the ice would be just fine. Get the warm up cheat sheet here. Warm-ups can improve performance, but not nearly as much as being properly fueled for the game. Ensure your nutrition is in check and you will be doing yourself a world of good. Warm-ups can and will improve your performance, but a warming up a body that isn’t properly fueled will still not put any gas in the tank. Using a combination of both proper game day nutrition and real warm-ups is where optimal performance is found. What can I do to make my legs not fatigue as quickly? Weight training + conditioning + proper nutrition + being 12% body fat or less. Weight training and conditioning are going to build your strength and endurance to perform better in a fatigued state, such as late into the 3rd period. It is the 3rd period where you can really tell who has elite athlete level conditioning and who does not. It’s important to point out here that you need to train like a hockey player, and not just train. These are two very different things and is what is going to separate you from the pack out on the ice. Make sure that whatever goal you have, you are using hockey training principles and hockey training programming to get there. Proper nutrition is absolutely vital because a machine cannot operate without fuel. Athletes are the machine, food is your fuel. It’s not enough anymore to rely on talent and natural gifts. There are too many good players out there putting in the work every day both on and off the ice to be the best. This is where a lot of athletes say “Well I don’t follow a meal plan and I feel pretty good”. There is a reason why sports nutrition specialists exist, they drastically improve your performance and recovery and fuel the body in a hockey specific way. Last but not least, being 12% body fat or less. This one is obvious, additional fat does you no good whatsoever. It does not make you stronger, you cannot contract fat like you can a muscle. It definitely doesn’t make you faster, and it definitely will cause you to fatigue quicker. Walk around all day with a 20 lbs weight vest and tell me how athletic you feel. One quick trick to help with fatigue is by using some beta alanine and citruline (ages 15+). Beta alanine and citruline are ingredients that I always use with my high level athletes during competition as it benefits the energy systems that hockey players are using to perform better both on the ice and in the gym. This product is a no-brainer for hockey players as it helps to improve both your strength and your endurance in a sport specific way. How much cardio should I be doing in ratio to weight training to prepare for an upcoming hockey season? This is a particularly tough question to generalize as each individual player would require different approaches. As an obvious example, if a player’s #1 weakness was his/her conditioning there would be a greater emphasis on achieving that over other priorities. You’re only ever as strong as your weakest link. In any case, I would like to set the record straight on what “cardio” means in the hockey dictionary. Many people right off the word “cardio” as long duration, steady state aerobic work. Such as jogging, walking, doing medium pace laps around the ice, biking, etc. Training only in this manner is not to a hockey player’s advantage at all as hockey is both an alactic and aerobic sport. Without getting into too much detail, the difference between aerobic and alactic is basically slow, non-explosive movement done for a longer period of time (aerobic) versus fast, explosive short duration activity (alactic). When you’re playing hockey, it is a short duration explosive sport interspersed by low intensity, longer duration recovery periods. Your shift is not a long time and in that time period there is high velocity direction change, shots, body checks, breakaways, getting it out of the corner, blowing by the defense-men, among many other things. In no way shape or form will only training in the aerobic-zone replicate and train the energy systems and substrates that a hockey athlete uses on the ice. The best answer here is found by training both aspects in the correct doses and using movements that have transfer from your dry-land training out to the ice. When I talk cardio with my hockey athletes I don’t use the word cardio, I use the word conditioning. We perform short duration, extremely difficult tasks that better replicate the energy systems that you are using on the ice so that there is more crossover from the gym to the ice and you become a better hockey player. In the beginning of the offseason, 3x per week of aerobic work is usually plenty, as you get closer to the season, it’s best to drop the aerobic work down and incorporate much more alactic work and perform anywhere from 2-3x per sessions per week depending on your needs/conditioning levels. 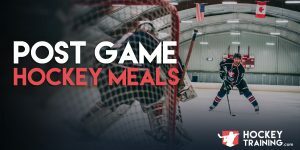 High carb or low carbs for hockey players? Again, this is a tough question to generalize for the entire population. To make it short, the more out of shape you are, the less carbs you get. The leaner you are, the more carbs you get. If you are very lean, you can have plenty of carbohydrates to fuel your practices, gym sessions, and games. If you’re over 15% body fat, you need some work. You would be on just enough carbohydrates to keep you performing at your best for games, but not enough to where it would damage your fat loss goals. An athlete who is at 15% body fat or more needs to work first on getting leaner. This doesn’t mean you have to sacrifice performance, carbohydrates given at the correct times will still ensure 100% performance output, and additionally your performance will further improve as you lose more body fat. Universally, hockey players require moderate amount of carbohydrates. Not low, and not high, moderate. Going too low hurts performance in most athletes, and going too high wouldn’t have any additional benefits going beyond your required energy output. Do we need to eat the same amount as the off-season during the season? If you’re one of these guys who needs to put on weight in the off-season, odds are you will be eating a lot more food. Simply because at that point it becomes your #1 priority and since it is the off season you will not be travelling as much so you can throw more food back in a convenient way. On the other hand, if you wanted to maintain that weight you gained in the off-season during the in-season you would have to eat just as much, or else it would be lost pretty quickly. This is always an individualized scenario, but it would go without saying that universally, yes, you would be eating roughly the same. If your goal was to get bigger in the off season, you would have to maintain that weight during the in-season with just as much food. Likewise, if your goal was to get leaner in the off-season, you would have to ensure you don’t overeat during the in-season. Are you at the best possible body composition you could be at to be the best you can be on the ice? The way you answer that question dictates how you’re going to eat both in the in-season and off-season. Because if you’re body composition is off, everything else suffers. For a full done for you hockey training program check out our In-Season and Off-Season programs here.